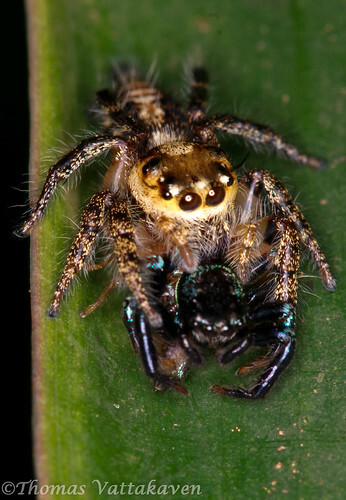 Nature Magnified: Do Spiders Eat Other Spiders? Do Spiders Eat Other Spiders? 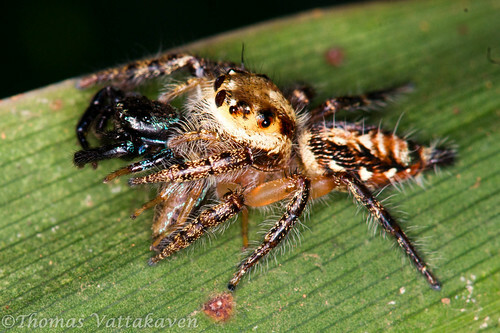 Most of us know that in some species of spiders, the female eats the male once mating has occurred, but have you heard of spiders catching and eating their own kind? When I took these images, I wasn’t quite sure what was going on here. It looked to me like one spider was eating another, but I wasn’t convinced. Perhaps it could be some kind of weird mating ritual? However, the knowledgeable folks at SpiderIndia have not only confirmed that what is happening here is predation, they have also identified the species for me. 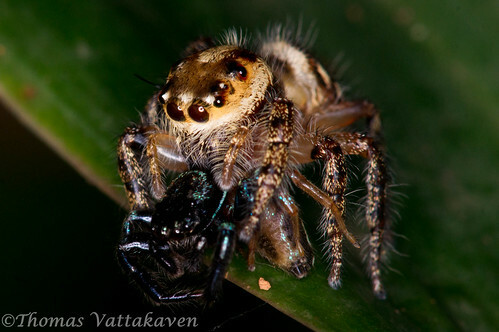 The predator in this case is Hyllus semicupreus and the prey is a Thiania bhamoensis (thanks Sudhi). 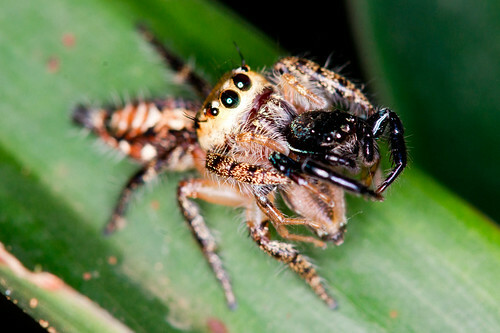 Ironically, the prey species is also called as the “fighting spider” in Southeast Asia and are used in spider fights! Looks like it met its match this time! 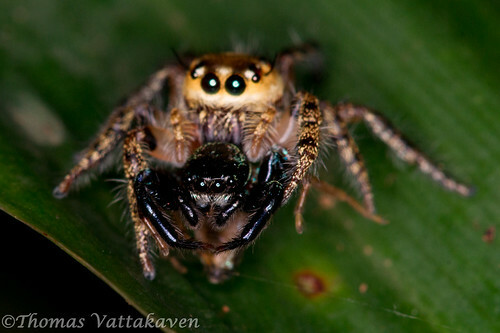 Anyway, it appears that inter-species predation in spiders is not uncommon. 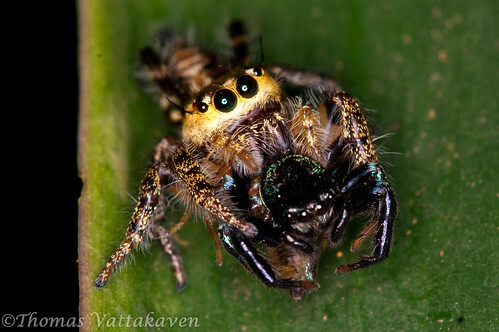 Apparently, it is most common in Jumping spiders (Salticidae) and certain genus such as Portia, prey primarily on other spiders. In fact, this species will stalk other spiders in its own web by shaking it. 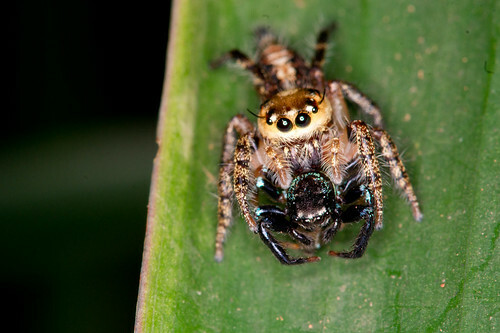 When the host spider comes to investigate, it ends up as prey! 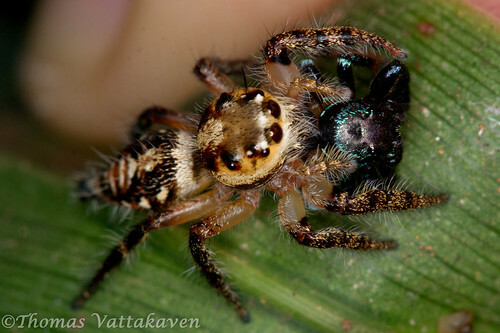 Members of this genus will even deceive eat their own species, hence the interspecies predation of spider-eating spider seen in these images are not that surprising. Its just another instance of nature’s hidden acts being caught and magnified on camera! If you enjoyed this post, subscribe to our feed or follow us on Facebook, Twitter, Google or your favourite bookmarking site.